The one thing these all have in common is that they are transitions. Transition means change. This change can be seamless, or it can be abrupt. They can be destabilizing and that means you (actually your routines) are vulnerable. So it’s time to pay attention, and to be aware. By staying aware we can minimize, if not entirely avoid, potential lapses. Why is this important? Because the sooner we recognize this potentially vulnerable stage, the less likely we are to fall into old or unhealthy patterns. Plan ahead. One of the best skills you can have on your weight loss journey is the ability to plan ahead and anticipate challenges. If you leave it to chance instead of planning ahead, you’re setting up a roadblock for yourself. We are all too busy to do that. Plus, our health is too important. Start by making a simple meal and exercise plan for the week. Consider any meals where it might be harder to eat well (like a dinner out) so you can plan the meals around it. Plan portions – not just meals. Even when you’re making smart choices at the grocery store, the portions can be… disproportionate. So when you when you buy chicken breasts, remember that their serving size might actually be enough for a family of six. If you are cooking for one, two or even three, consider turning them into two whole meals. The same can certainly be said for snack sizes. Shop with your whole week in mind. If you shop and cook in bulk over the weekend, armed with your meal plan when you hit the store, weeknight meals are just about warming up. Plan your weekday lunches out before you even walk through the doors of the grocery store. And don’t forget snacks and breakfast. Those are often two places where we take shortcuts and eat sugar-heavy foods. 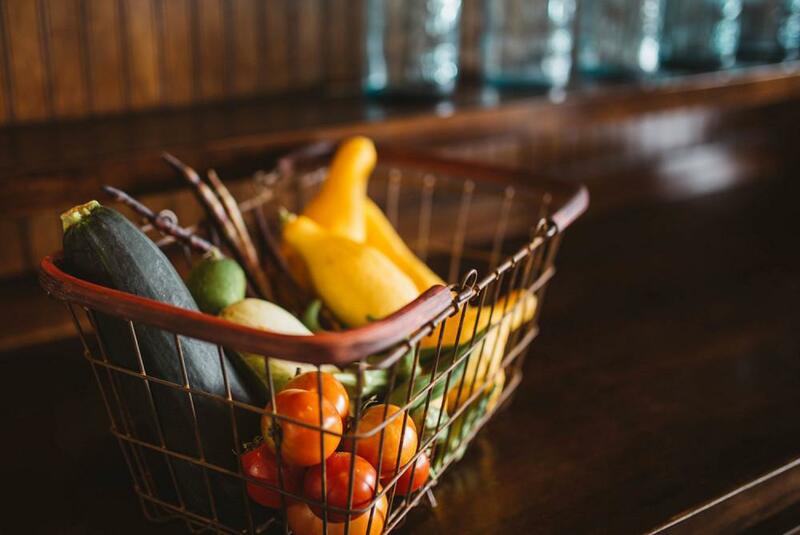 Make sure your grocery shopping includes satisfying options that will get you through to the next meal without lots of sugar. Start a new fitness class or schedule gym time or time outside. When you get moving everyday or nearly everyday, it requires less motivation and it’s almost like rote memory for your mind and body. Plus, as the weather gets a bit cooler, it can be nice to get moving outside in the brisk fall air. Adding a couple of different ways to exercise to your weekly plan can keep you from feeling bored. Find a partner. Having an accountability partner makes it easier to stick to your plan and motivate each other. If you exercise together, it’s more fun. Also, don’t forget about one of the best fitness partners: your dog. He’s ready to help by going for a walk each and every day. Talk about accountability! Use healthy shortcuts like pre-cut vegetables. Some even come in single serving sizes, so it’s easy to pull a pack of carrots for any mid-afternoon hunger. You can also substitute another healthy food that cooks quickly. If chicken breasts take too long to cook after work, try using thinly cut, lean pork chops. They cook in half the time. The portion planning we discussed earlier can be your friend here; cook all the protein one night to be used for two meals. Use technology as your ally. Did you know there are dozens of smartphone apps out there to hold you to your fitness routine? Some even charge you money if you skip a workout. That might hold you a little too accountable, but a basic reminder or a game with incentives can really help you stay consistent. There are also apps that will help with meal planning and grocery shopping. Notes apps like Evernote have a list option that’s easy to add to on the go and keep for future reference. There’s even an app called Grocery IQ that makes shopping suggestions for you. Find a system that works for you and keep it up.